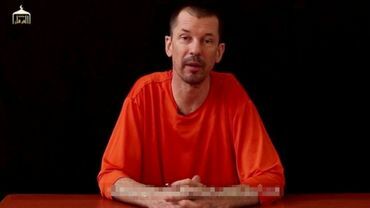 The militant Islamic State group has released a new video in which a man identifying himself as a British journalist says that he will "show you the truth" about ISIS and how western media is manipulating the public. Thank you Carrie. Just watched it on the news a few minutes ago. He is a lot thinner. Agree with Natasha and Nancy. . .until ISIS and the other fundamentalist Islamic nutjobs are put out of service, I don't think anyone is really safe. Noted,something should be done about them urgently. Agree with all of the above comments. J think the time has passed for niceties with this mob of riffraff murderers. Sorry for the typing mistake above, it's dark and I hit j instead of I. Another recruiting v�deo from ISIS,I'm afraid their numbers will rise sibstantially. I agree with Dawn D. the time has passed for niceties ,they need to be exterminated.